Atlanta, Ga. (May 31, 2016) – Join downtown Atlanta’s newest dining destination JP Atlanta and Executive Chef Julio Delgado for a Puerto Rican heritage celebration as he joins forces with Atlanta’s top Latino chefs for an unforgettable evening filled with festive music, food and drinks. 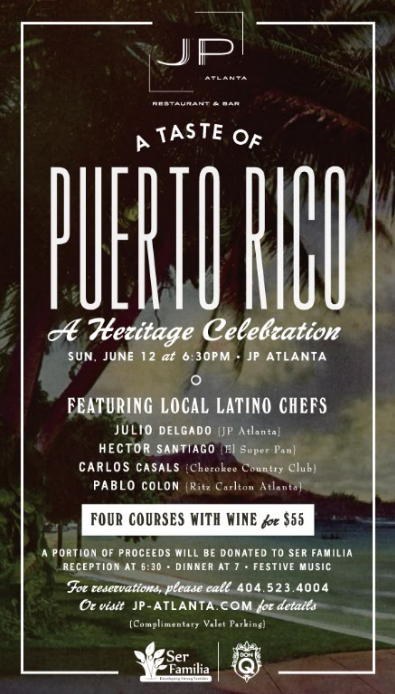 On Sunday, June 12th, Chef Delgado will team up with chefs Hector Santiago of El Super Pan, Carlos Casals of Cherokee Country Club and Pablo Colon of Ritz Carlton Atlanta to treat guests to a global dining experience with a Puerto Rican-inspired four course menu and wine pairings. A portion of proceeds will benefit Ser Familia, a local charity that strengthens, revitalizes and equips the local Latino community. Guests will enjoy an interactive dining experience as each chef will provide insight on their dish and how it was influenced by their strong heritage. The reception will begin with live music and specialty cocktails featuring Don Q rum at 6:30 p.m. followed by dinner at 7:00 p.m. The cost is $55 per person and includes specially curated wine pairings. Space is limited. To book your spot at this special dinner, please call (404) 523-4004 or visit www.jp-atlanta.com.